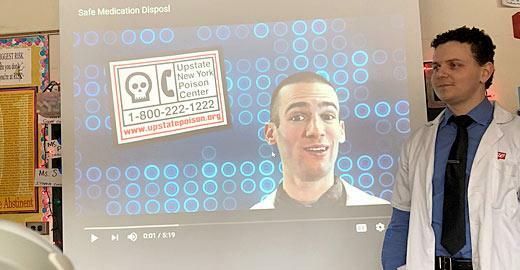 Pharmacists and pharmacy interns rotating through Walgreen’s pharmacies have been taking our Safe Meds – Safe Disposal Program out on the road to teens and tweens in our 54 county service area of NYS (all but NYC, Westchester County and Long Island). Walgreen’s team targets sites such as schools (charter, elementary, middle, alternative programs etc.) scout groups, community centers, health centers and other locations. Our goal is for students to become the “keepers” of the information, to help their families make informed decisions about the safe use of meds and safe disposal as well as when to call a poison center about medication. Providing this information at a formative age will equip them to become responsible adults. Walgreen’s encourage their pharmacists and interns to participate in teaching this program as a community service. The program script provides step-by-step instruction for “teachers’ to provide consistency in messaging. Following the program, the “teachers’ and the participants are asked to complete an online survey. Results will be used to make adjustments to the program and data obtained will provide input for future funding. A HUGE thank-you to Walgreen’s and Walgreen’s Area Healthcare Manager, John Marraffa,, for making this collaboration possible.